Cheshire Nursery - Welcome to Cheshire Garden Center - Large selection of locally grown annuals, perennials, fresh flowers, floral arrangement, garden supplies and more. 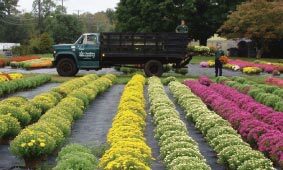 We proudly serve Connecticut as one of the top garden centers in the state offering the finest selection of locally grown annuals, perennials, trees, shrubs, and houseplants. Our friendly and experienced staff will be more than happy to help you accentuate your gardens with our premium mulches, stone, and statuary. We know that maintaining your gardens can be a challenge, and for that reason we keep our store fully stocked with the best garden tools and remedies on the market. As a business that operates year round, seven days a week, we are always available to cater to your gardening needs. Please use the menu on the right to navigate through our vast selection.